About a third of the rent stabilized tenants with garage spaces attended Gluck's May 7, 2008 appeal of the garage case against the New York State Division of Housing & Community Renewal (DHCR). 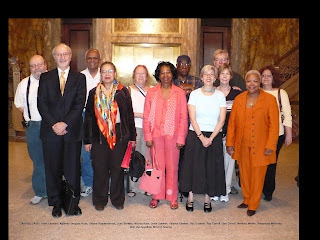 See image of some of those tenants -- next to our tall attorney in the front row. Gluck claims that our spaces should be rented at full market rate (whatever ICON - the owner of Kensington Enterprises - wants to charge). But DHCR and at least one court so far have ruled that those spaces must be rent stabilized for tenants who held them while we were in Mitchell-Lama. Gluck appealed the last court decision to the state's mid-level court, the Appellate Division. The 5 judges were knowledgeable about the issue, and asked hard questions of Gluck's lawyer. DHCR's lawyer, Caroline Sullivan, carried the main burden since Gluck's case is against DHCR, but our lawyer, Jacques Rose, presented the important points succinctly and sharply. The decision may take up to many months.